Third party companies offer to install solar PV arrays on your home and promise to save you money on your monthly electric utility costs. Bloomberg found they use a mix of false assertions, lies, cherry picking and fear as sales methods, to persuade homeowners to sign up and lease the solar PV system for decades. Over time, the lease costs increase such that the homeowner spends far more in the future, while the third party company collects large government subsidies. Few homeowners understand what they got in to. When they go to sell their home, the lease is transferred to the buyer – in effect, TPO solar PV arrays become a dead weight on the home’s future sales potential, particularly to informed buyers who understand the game. The role played by propaganda in the public discussion of the #ACA #ObamaCare-Did you know the ACA has a pre-existing condition waiting period? Propaganda messaging played and continues to play an enormous role in the public’s view on the Affordable Care Act a.k.a. ObamaCare. For example, Democrats have made pre-existing condition exclusions the centerpiece of their 2018 public commentary on the ACA. Yet, never explained is that most Americans already had protections against pre-existing condition exclusions – it was the individual market that did not have protections (details in the post). Further, contrary to what you have been led to believe, the ACA does, in fact, establish a pre-existing condition waiting period. The ACA did not eliminate pre-existing condition waiting periods (see post for details). The propaganda messaging used the methods of Fear, Assertion, Lying and What You See Is All There Is and has been extraordinarily effective. The Republican opposition has been clumsy and largely counterproductive with utterly ineffective propaganda messaging of its own. Obamacare was judged unconstitutional by a Federal judge today. In response, a number of politicians made comments such as this one: “Today’s ruling is an assault on 133 million Americans with preexisting conditions”. That claim, however, is false. It is not well known but HIPAA (passed in 1996) provided protections for many, and about half of the U.S. states enacted various protections against pre-existing condition exclusions. This was hidden by design. By implying (falsely) that 1/3d of the U.S. population would be denied health insurance, the method of fear is used to create political support. News media has advocated a meme that housing rents increase faster than wages but according to the census data, median wages have grown much faster than median rent. In light of the survey finding most voters are badly misinformed on well known and popular public policy issues the same is likely true about social media posts. It is likely that more than half of political or policy oriented social media posts are incorrect. But depending on who makes the posts, and how many followers they have, their incorrect posts can be influential – and plant non factual and illogical constructions in the minds of their targets. Part 8: Is Denmark a socialist country? This blog analyzed a popular social media propaganda post that was widely distributed in 2016. 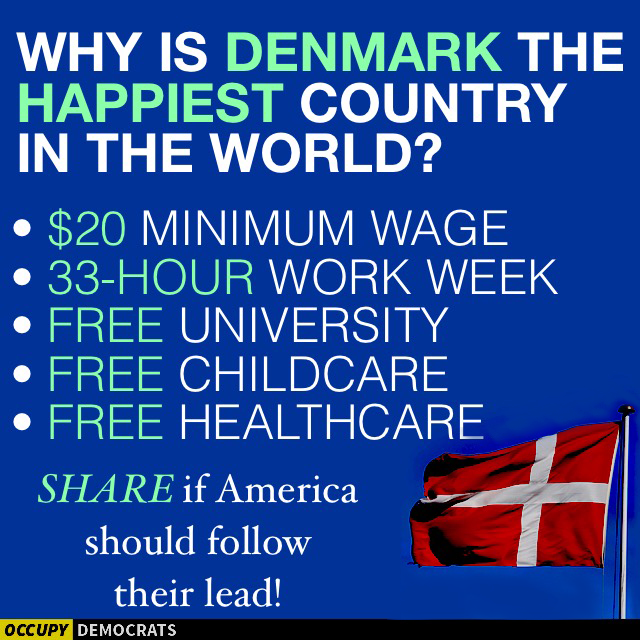 The poster encouraged viewers to share if you wanted the U.S. to be just like Denmark. Nearly all the claims about Denmark, however, were false. Yet the poster was widely shared. Another popular meme is that Denmark is a socialist country and we should be just like Denmark. Except Denmark is not a socialist country – and that is according to the Prime Minister of Denmark.